We are family first, a business second. Lee and I (Sidney) met in the fall of 2007, and bonded instantly. Our close friendship turned into a relationship that led us down the aisle in 2012. We do not like to be apart, and are each other's best friend. We tackle all life's obstacles as a team, and share the joy of our individual, and collective triumphs. We attended law school together, and will always consider ourselves lawyers, as well as woodworkers. Lee introduced me to woodworking early in our relationship, and I always encouraged him to expand his skills. I could see he possessed the heart and talent for the craft. 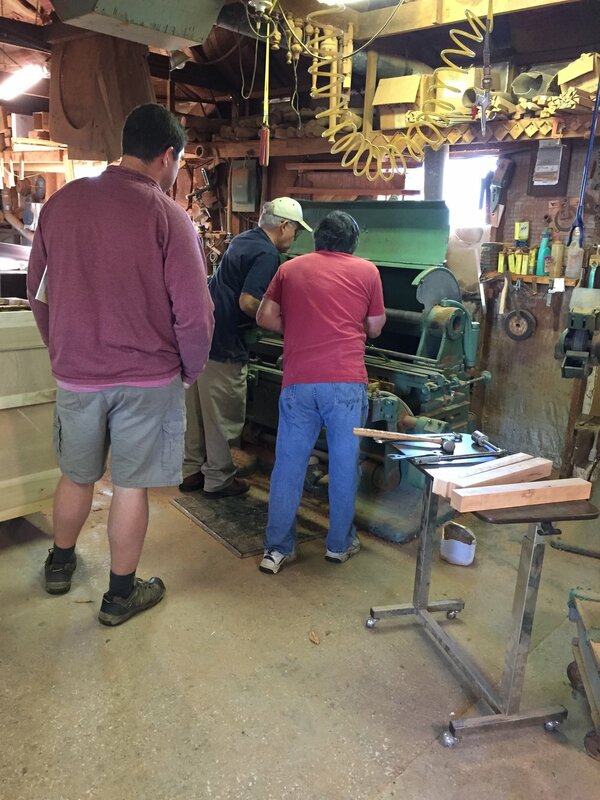 Lee's uncle and grandfather are talented woodworkers in their own right, and have inspired him. 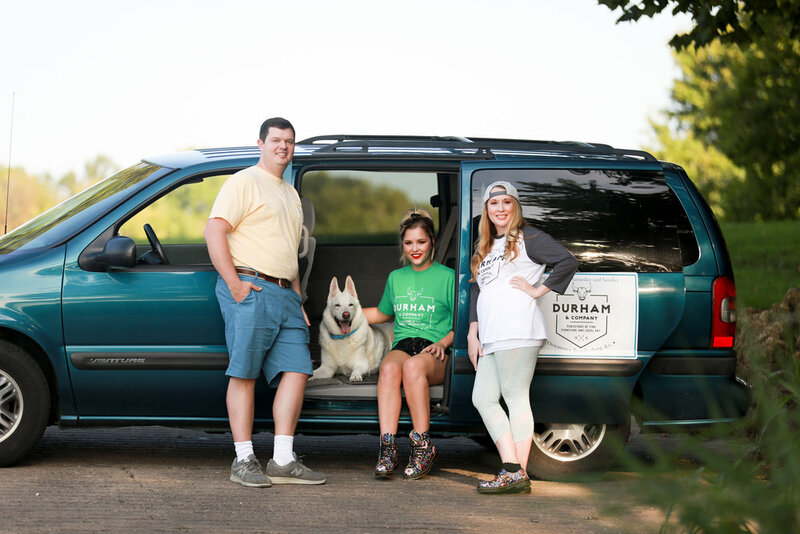 Lee always said he could not make a career out of woodworking, but after a stressful couple of years in the legal field, he decided to give it a go, and Durham & Company Woodworks was born in September of 2016. All we had was a name and a vision when we met the Rectors. Lee found a bed frame on Craig's List that was in the traditional cherry style we favor; the inscription on the back led us to Bowling Green, Kentucky, and Rector's Cherry Reproductions. Duane and Ray Rector are second generation woodworkers; their father started the business over six decades ago. We visited the Rectors one weekend, looking for nightstands to match our new bed. We became fast friends with Duane who gave us a tour of his shop; and we felt like we had stepped back in time. I told Lee that I felt like we had stumbled onto something magical, and I was right. Lee called Duane and asked him, "what's your exit plan." Duane told us on one of our visits that he had been praying about what he should do next; his parents had both passed away, and he and Ray were thinking about winding down. Duane figures we were the answer to his prayers, but we consider ourselves very blessed, and extremely fortunate to have found the Rectors. They have become like family over the last many months. Duane and his wife, Karen Rector opened their home and their hearts to us on several occasions. 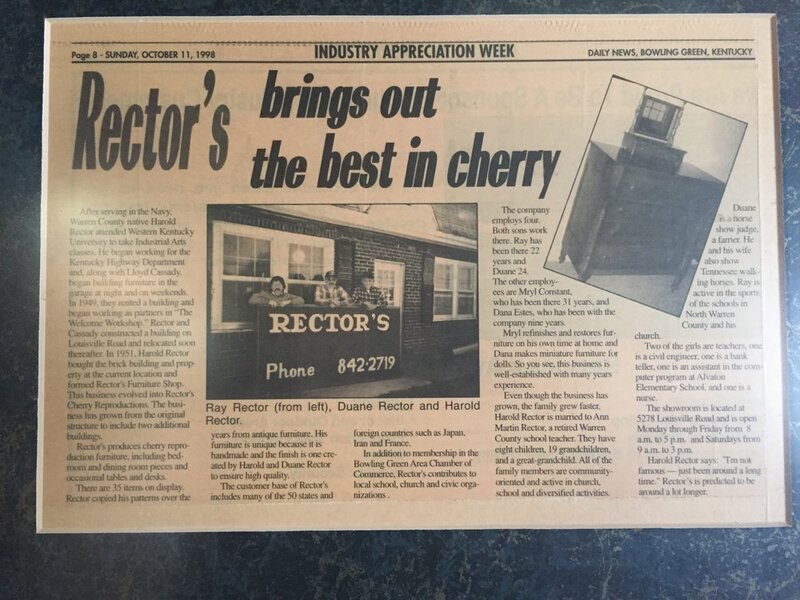 Durham & Company Woodworks is the proud owner of the woodworking equipment that Rector's has used all these many years; along with it comes a mighty legacy to honor, and an opportunity to blaze our own trail. The path that led us to the former Little Dave's "Down on the the River" Restaurant building located at 155 Main St. Brandenburg, Kentucky is equally as compelling. We felt like we were in a catch 22 situation. 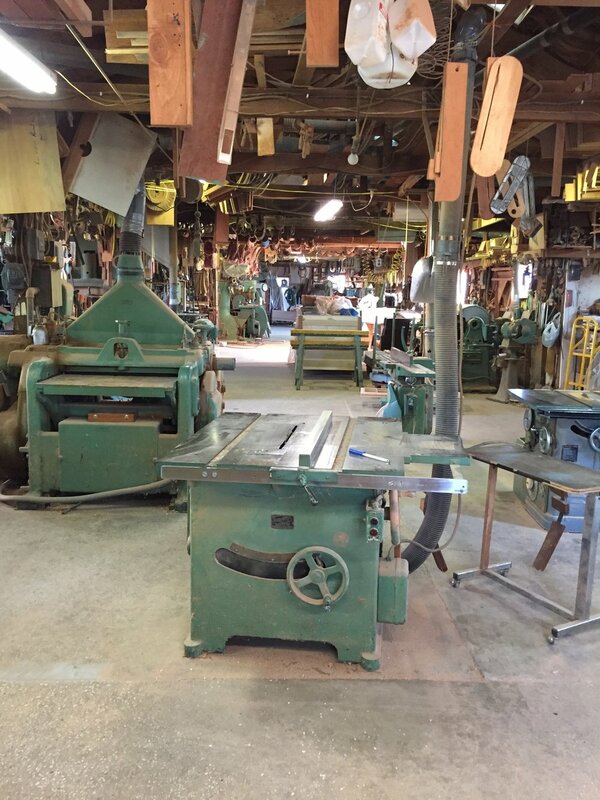 We had found commercial woodworking equipment, but had no place to put it, and no means to purchase a building without the income that would be generated from utilizing the equipment to build furniture to sell. Downtown Brandenburg was ravished by an F5 tornado in 1974. What remains is just a glimmer of the area's former glory. In lieu of rebuilding downtown, businesses and residents fled the area. My cousin mentioned Little Dave's as a possible location for us, and we were skeptical. The building was in bad shape, in an area of town that wasn't exactly booming. People have mostly given up on downtown Brandenburg, but there have always been those working for it's revitalization. The river makes a beautiful backdrop for what remains. Kendell told us she believed in the vision Lee and I shared with her, and asked if we would allow her to part of it, and we replied with a resounding yes. Kendell is a talented artist in her own right. The three of us went to look at Little Dave's; among the dilapidated surroundings, we saw what could be. Kendell purchased the building, and has allowed for this dream to become a reality.